Airports and flights are going to be packed. Here’s how to prepare yourself for holiday travel. Next week is the busiest week of the year at many airports around the country. As many of us gear up to visit friends and family, take a moment now. Pour yourself a cup of gratitude and start making your list of what to take and what to leave behind. Even though you have your tickets, take a moment now and review them. If you're leaving on a red-eye flight, make sure you know to check in on the evening before your flight. Make sure you have assigned seats. Make sure your mileage number is in your reservation (it matters), along with your Global Entry number (if applicable). If you can't find your reservation or cannot see the details, call your airline and confirm your arrangements. Do you have a ride to the airport? This can trim 30-45 minutes off your airport run. That's especially true if there's bad weather or if the parking lot is full. Before you leave for the airport, though, go online and check in for your flight. You can do this 24 hours before departure, but I like to wait a little bit. That way, if the flight is delayed it will show up as I'm checking in. Are you checking any bags? This makes a difference, of course. If you have no bags to check, you can head straight for security. But if you have to stop to drop your bags, that can take an extra few minutes. 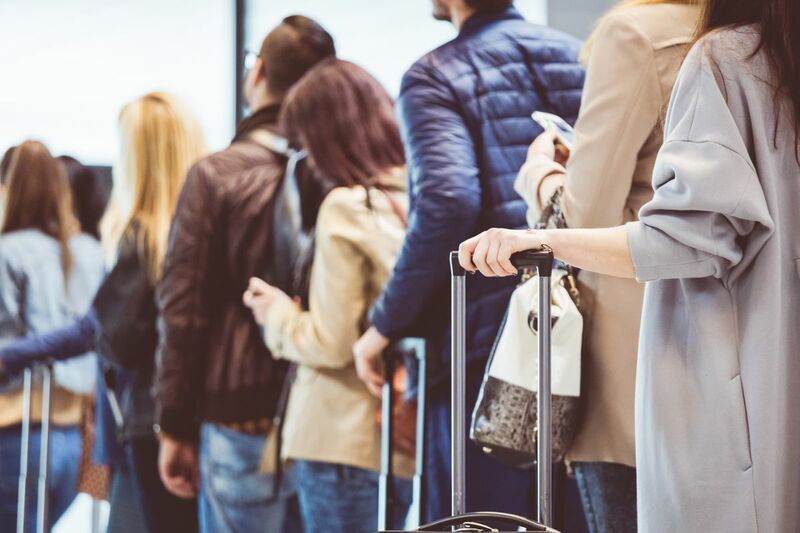 Paying for the checked bags takes even longer, so plan ahead. If you have "pre-check" on your boarding pass, the TSA checkpoint can be a breeze. Otherwise, prepare for delays. Be prepared to take out your electronics for separate screening (everything larger than a cellphone). That means more bins to watch as you go through the metal detector. 1. Noise-canceling headphones: Lots of kids love their earbuds. And there are some fancy ones that have the noise-cancelling function. I still prefer the over-the-ear model, such as those produced by Bose (bose.com) or Beats (beatsbydre.com). Even if I'm not listening to music, the noise-canceling function makes the airport or the airplane quieter. 2. Portable charger pack: Finding a plug-in for my phone or laptop is getting easier at the airport, but there still are not enough plugs. That's why I carry one of those heavy bricks that can keep my phone going for a few more hours before plugging in. Both Anker (anker.com) and MyCharge (mycharge.com) have pocket-sized models. 3. Headlamp: This sounds crazy until you're in a dark plane and your overhead light doesn't work. You can go to REI and find one, or order one from Petzl (petzl.com). 4. Medicine, car keys and cash: Don't put these things in your checked baggage. Ever since airlines started charging for checked bags and weighing carry-on luggage, travelers have gotten more creative about their gear. One company, ScotteVest (scottevest.com), has developed shirts, pants, vests and coats with a bunch of extra pockets. In a pinch, you can put loads of heavy stuff in the pockets and have your hands free. I admit, I have slipped my heavy video camera in one of the pockets just to get around the weight restrictions. Even if you're not shuffling your carry-on luggage, having lots of pockets can help you keep track of things when you're traveling. For example, my credit card has slipped out of my pocket more than once after I purchased one of those fruit-and-cheese platters on Alaska Airlines. But now, I have a well-engineered jacket from ExOfficio (exofficio.com) with all kinds of pockets that I can reach even when I'm crammed in my airline seat. You can count on most flights being completely full over the holidays. So as you get on board, it's best to have all of your essentials close at hand. That includes your water bottle (which you refilled after going through security), your take-away sandwich or snack, your blanket, pillow or sweater. If you're traveling with the kids, there's another list which includes books, toys, emergency snacks and other items to keep kids occupied. If you made it to the airport without a book for the kids, be sure and check out the "Read on the Fly" kiosks for free reading material. There's one in the nursery on the "B" concourse in Anchorage (readonthefly.com/our-locations). It's the season to give thanks. That includes a special thanks for the airports, all of the airlines and the folks who are there to help you around the clock. I'm also thankful for some great bargains on airfares still available between Thanksgiving and Christmas (Nov. 29-Dec. 15). Right now, you can fly between Anchorage and Seattle for $205 round trip on Delta (or $423 round trip in first class). It's likely that Alaska Airlines will match these rates, which also are available for January and February of next year. Between Anchorage and Los Angeles, the rate is as low as $283 round trip (from either Anchorage or Fairbanks). The fare from Anchorage to Boston is as low as $331 round trip. Add $30 round trip on Delta if you want to pre-reserve your seat. Otherwise, you'll be sitting in the middle. So whether you're headed to Seattle or all the way across the country, be sure and rest up, stay hydrated and get to the airport two hours before your flight.